Who is Responsible for an Uber or Lyft Accident? | Hupy and Abraham, S.C.
Ride-Sharing: Insurance and Injuries, Who Pays for an Accident? “Ride-sharing” is a thriving new industry, quickly populated by companies like Uber, Lyft and Sidecar. Ride-sharing is supposed to be like “your friend with a car,” as Lyft proclaims. Passengers seeking a ride simply need to log into the services app and they will be connected with a driver nearby. Unlike a taxi, the transaction takes place via smartphone and nearly anyone can become employed as a driver. But, the massive looming question surrounding this new industry really seems to be about insurance. Who is liable in the event of an accident -- the driver, the ride- sharing company or the passenger? Uber, Lyft and Sidecar would rather have you think of them as technology companies. Uber often states that it simply provides the app for use by drivers, and that it is in no way a transportation company. After an Uber driver struck and killed a six-year-old girl in a crosswalk while waiting for passengers, Uber was quick to point out what sort of company they really were -- an app service. Uber claims that they will cover accidents occurring during a business transaction, but they denied any liability for the accident on the grounds that the driver didn’t have a passenger in the car at the time. For the most part, ride-sharing services like Uber state that once their app has been turned on and a passenger has been picked up, that its insurance would shift coverage to cover the driver. When the app is off, coverage is supposed to be relied on by the drivers PCI (Personal Car Insurance). It is the gap in between those two periods, when the Uber app is on, but there's no passenger in the vehicle, when problems arise. This “insurance-limbo” places much of the insurance burden on the drivers, who are using their personal vehicles and PCI. What these drivers may not know, however, is that their PCI policy may not cover them if they're driving for Uber, Lyft or any other "ride-sharing" app. This is because most insurance companies see them as commercial drivers when providing rides. PCI policies typically do not cover an accident that occurs while conducting commercial activity. However, even attempting to file a claim or revealing to your insurance provider your intent to become a ride-share driver has compelled providers like Geico to cancel the policies of drivers because of Uber and Lyft activities. So, when a passenger gets into a ride-sharing vehicle, in most states, the insurance coverage becomes a bit murky. Drivers don’t want to tell their providers about their commercial activities out of fear of denial of claim or cancelation of policy. But their employers (Uber, Lyft, Sidecar) expect them to file claims with their PCI first, or don’t want to take on liability period. What Do I Do As a Passenger? As a passenger, you should be covered by the ride-sharing company’s insurance policy. But in the event that the driver’s insurance company pushes back, you may be denied compensation for your injuries if your ride-sharing drivers’ PCI doesn’t cover driving-for-profit, or he hasn’t obtained a commercial drivers license. Since your driver may only have minimal coverage, you would expect the remaining costs to fall to your insurance provider. However, many people do not have large underinsured policies, and the costs may be too great for your policy. The attorneys at Hupy and Abraham will gladly help you contact your insurance provider to see about changing your underinsured policy. This is a complicated and confusing new industry that is difficult to navigate. 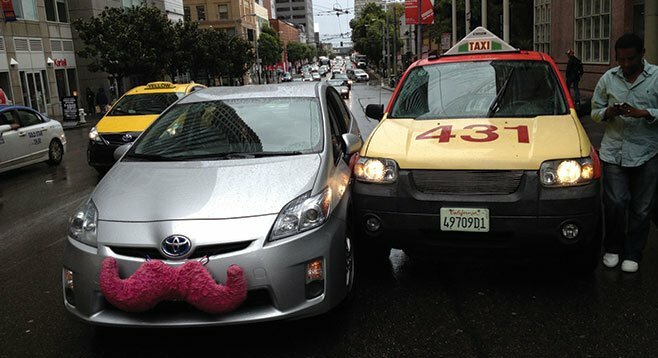 Uber and Lyft are new companies fighting for market share, set to defend their profits and reputations aggressively when faced with negligence charges. Similarly, insurance companies do not pay large damage claims willingly. The experienced attorneys at Hupy and Abraham are skilled in complicated litigation involving automobile accidents, as well as dealing with insurance companies. If you or a loved one have been injured in an accident, while participating in a ride-share service, please contact us at 800-800-5678.